Do you have a group of video editors that you want to work from the same assets without having to shuffle drives back and forth? Using your existing network cabling in your building we can build a system that will allow your team to edit HD and 4K video over your existing network cabling while also using the same system as a file server for the rest of your team. In 2008, Maxx Digital developed Final Share, a simple, inexpensive shared storage solution that was easy to use. This was in contrast to the large, expensive, complex solutions that were on the market at the time. Throughout the years, technology dramatically changed. The networking business for the video industry evolved from 2Gig Fiber, to Ethernet, to multiple Ethernet ports bonded together, to its current state, which is the use of 10Gig Ethernet. With the advent of Thunderbolt technology, the cost of building a video shared storage solution as been dramatically reduced. This was highlighted with the introduction of the G-Tech Studio XL. The G-Tech Studio XL is a high-speed Thunderbolt2, eight-bay drive array, capable of holding upto 64 Terabytes of storage. When connected to a MacPro computer, this becomes the basis for a simple to use shared storage system. Maxx Digital exclusively uses the G-Tech Studio XL drive chassis for their Thunderbolt-based shared storage systems, because of their ease of installation, wonderful performance, incredible reliability, and low cost. Maxx Digital Final Share has evolved into what is now ThunderShare using all Thunderbolt peripherals. We continue to use inexpensive 10Gig Ethernet products to make these systems work. 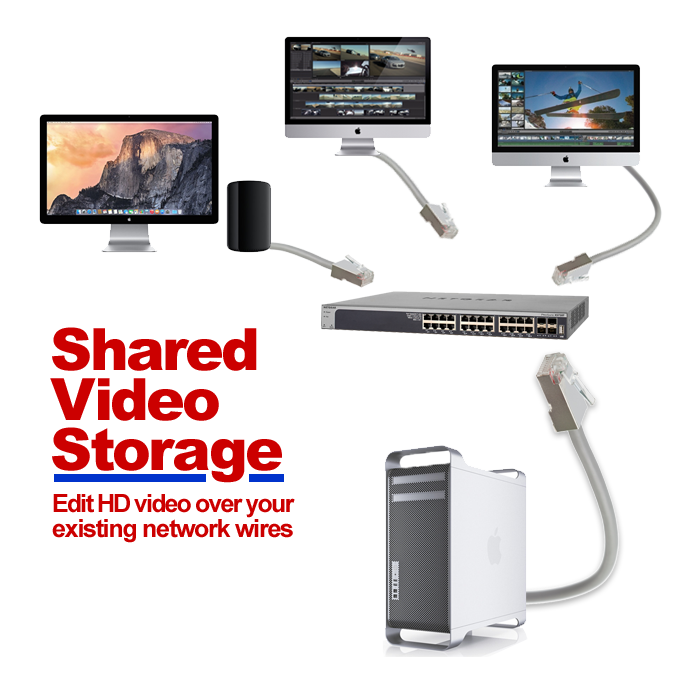 When using a Mac Pro or a Mac Mini as a server, the connection of a thunderbolt to 10Gig Ethernet adaptor, which in turn connects to a full 10 Gig Ethernet switch, allows for hi-speed data communication to client computers. This allows for editing not only High-Definition video media from every computer on the network, but also allows for editing 4K, 5K and 6K media as well, with the use of thunderbolt to 10Gig Ethernet adaptors on the client computers. The G-Tech Studio XL has enough speed and performance capability, so that multiple client computers, can all edit the same 4K media at the same time, all from the same G-Tech Studio XL drive chassis. The Maxx Digital ThunderShare system is so versatile is can not only connect to Apple Macintosh Computers via 1Gig Ethernet or 10Gig Ethernet (both new and legacy models running at least the OS X 10.6.8 operating system), but can connect to any Windows 7 or Windows 8.1 PC as well, as the operating system that is running Maxx Digital ThunderShare supports SMB3 (the protocol used by Windows PC’s), AFP (Apple’s own network protocol) and NFS (the Unix network protocol). The days of having to rely on large noisy server RAID arrays are over. With the advent of the G-Tech Studio XL, not only can we achieve 64 Terabytes in a tiny chassis that can sit on a desktop along side a new Mac Pro or Mac Mini, but we can continue to daisy chain additional G-Tech Studio XL’s for additional storage. Plug in another thunderbolt cable on the G-Tech Studio XL Thunderbolt loop, and you have more storage instantly.